Top UN Envoy in Iraq Sergio Vieira de Mello Killed in Blast at UN HQ in Baghdad; We Hear a Democracy Now! Interview With Him from September 2002 | Democracy Now! The United Nations headquarters in Baghdad has been destroyed by a truck bomb and 20 people have died in one of the deadliest attacks ever directed at the UN. Among the dead was Sergio Vieira de Mello, the top UN official in Baghdad. Dozens were also wounded. The 55-year-old Brazilian diplomat had served in the United Nations since 1969 in some of the world’s most sensitive areas including East Timor, Yugoslavia, Cambodia and Bangladesh. In 2000 Vieria de Mello took the lead in the UN’s operation in East Timor from Indonesian occupation to East Timor’s independence. In late 2002 he took over as head of the UN’s Human Rights Commission and was appointed as UN special representative in Iraq in earlier this year. In Brazil President Lula declared three days of national mourning in honor of de Mello. Sergio Vieira de Mello, interview conducted on September 27th 2002 outside the United Nations in New York during a flag raising ceremony celebrating East Timor’s independence from Indonesia. De Mello, a Brazilian born diplomat had worked for more than 30 years in the United Nations including stints in East Timor, Kosovo, Cambodia and Cyprus. SERGIO DE MELLO: To see that flag flying on First Avenue in front of this building is very, very important to me. As you know, this is the end of a long and painful, sad saga. The fact that East Timor today has been admitted as a full member of the United Nations is the true culmination of efforts, efforts over centuries not just the last two and half decades. And it’s also a reward to all of those who attempted to support the East Timoris in their struggle. Last, but not least, let me say as new U.N. High Commissioner for Human Rights, to be here today, after having tried for two and half years to build new democratic institutions based on the rigorous respect of human rights, is also an inspiration for the future. And last, but not least, an encouragement to continue to stand by East Timor in consolidating all that they have achieved with our support in the last three years or so. In particular, women. The right of women, the right to enjoy fully their role in society, and something, that as you know, we promoted while we were in East Timor and that I will continue to support very strongly from my new post in Geneva. AMY GOODMAN: And what about an international criminal tribunal for those responsible for the killings in East Timor. SERGIO DE MELLO: This, as you know, is a question that the secretary general and security council had decided in early 2000 to put aside, so as to give the Indonesian justice system the opportunity of doing justice. Because, as you know, priorities should always be given to national judicial systems. I have been very disappointed by the outcome of the recent trials. My hope is that, at the appeals level, the Indonesian government and prosecutor general will seek much higher sentences than the three that the tribunal decided to give to three of the accused, and will seek to bring the seven who were acquitted back into court, because otherwise the credibility of the human rights tribunal of Indonesia will be questioned. And the debate over another institution, perhaps an international jurisdiction, will be reopened in this building. AMY GOODMAN: Finally on another issue, and that is the U.S. seeking the powers to bomb Iraq and to invade Iraq, your response. SERGIO DE MELLO: No, I will not comment on that, because that is obviously a question for the Secretary General and for the Security Council. Like in any conflict, we are concerned that civilian populations should be spared, that every effort must be made in any war, in any internal conflict, never to target civilians. And should war erupt in Iraq, I believe the Iraqi people don’t deserve more suffering. They have suffered enough. AMY GOODMAN: Sergio de Mello, the head of the U.N. mission in Iraq. He was killed yesterday when a truck bomb exploded below his office window at the U.N. compound in Baghdad. He died, along with at least 19 others. More than 100 people were wounded. 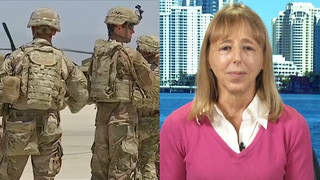 The names of the people that have been made public so far who were killed at the U.N. compound, in addition to Sergio de Mello, are Ranillo Buenaventura, who was 47, from the Philippines, working for the U.N. Humanitarian Coordination Office; Rick Hooper, 40 years old, from the U.N. Department of Political Affairs, on special assignment with the U.N. in Iraq; Jean-Selim Kanaan, 33, from Egypt, employed in de Mello’s office; Chris Klein-Beckman, 32, of Canada, Program Coordinator for Unicef in Iraq; Marilyn Manuel, 53, of the Philippines, employed in de Mello’s office. Fiona Watson, 35 of Britain. Political Affairs Officer, working in de Mello’s office; and Captain Manuel Martin Oar, of Spain, working for Spanish Special Ambassador to Iraq, Miguel Benzo Perea. Just some of the names of the casualties in Iraq yesterday, in one of the deadliest attacks on the United Nations in its 58 year history.